LONDON 2012 LEGACY: PARK OPEN FOR ALL TODAY. The news that the Olympic Park is to be reopen for the public today fills me with hope that, one day (perhaps in 2018?!? ), I can feel the same about the Games have been hosted in Rio. The Summer of 2012 was simply magical. Having worked in Sports all my life I was like a kid at Disneyland. I wanted to see everything, be everywhere, take in as much as possible. And I did ! And I dragged my 2 children along. It was a spectacular demonstration of Sports Achievements for sure but it was also an impressive show of competence, politeness, respect and tolerance by the British people, specially the volunteers. What was once an industrial wasteland became a theatre of sporting dreams. 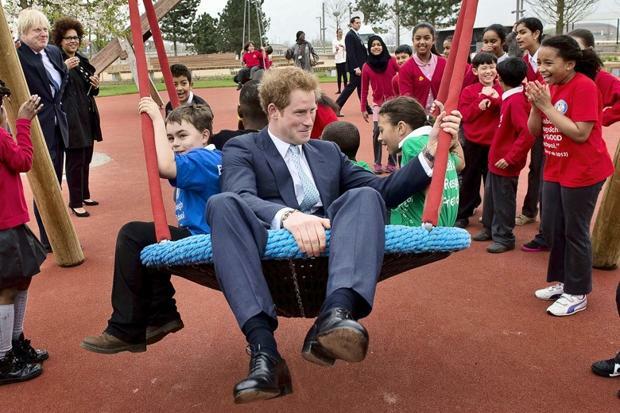 Yesterday, less than two years later, Prince Harry visited the now called Queen Elizabeth Olympic Park and played with local school children at the latest section, an amazing public pleasure gardens, to be added to the already open Swim and Velo Centres. He said he expected Prince George to be a future visitor. The conversion cost £300 million – on top of the already £12 billion cost of the Games. A similar sum will be a hard one to swallow by the Brazilians, already having difficulties to digest the cost of the World Cup, due to start in June. From now, however, it is for everybody to make use, stroll, cycle and run where the greatest have been. The southern section of the 560-acre site, closest to the stadium, features a promenade lined with 100 trees designed by the team behind New York’s acclaimed High Line park, and a fountain with 195 jets. Though the Olympic Stadium will not reopen as a football arena for another two years, the Aquatics Centre, Copper Box Arena, and the cycling, hockey and tennis centres are already operating.